I don’t know if Daniel H. Wilson was an only child or not. I do know that he claims he “saw an episode of Small Wonder and decided to get my PhD,” which leads me to believe he might be. I was an only child, and I spent much of my childhood trying to build robots, unsuccessfully. I believed that attaching enough electrical wires to anything, whether cardboard, plastic, or Play-Dough, would make that thing move. It was lucky I never had access to anything more powerful than a nine-volt battery. Wilson is hot right now. His first book, How to Survive a Robot Uprising: Tips on Defending Yourself against the Coming Rebellion, has already been optioned for a movie, and has led to lectures and interviews from sources as disparate as Google Media and the podcast Keith and the Girl. The big joke is that the information on robotics throughout the book is all true. Wilson does in fact have a PhD in Robotics from the Robotics Institute of Carnegie Mellon University, and for information about areas outside his specialty—smart homes—he consulted his colleagues at the Institute, or other experts. This is the best information on surviving a robotic holocaust you’re likely to get. Incidentally, the area where Wilson had the most trouble getting information, according to the Google Media lecture, was on the effects and treatments of laser wounds. No hospital he called would talk with him, for fear that someone might rely on the information they gave him and sue the hospital. He was finally able to find information about laser wounds in an Army field manual. I for one am relieved that, in case of laser attack, our military is ready. In the introduction (labeled “Briefing”) to Robot Uprising, Wilson notes that “In Japan, fuzzy little real robots are delivering much appreciated hug therapy to the elderly. Children are frolicking with smiling robot toys.” These do not sound like bad reasons to build robots, though I wonder if it wouldn’t take less effort and money overall for the robotics engineers to simply hug elderly persons and play with children. Most of the robots in the book are more sinister that this, of course, and are equipped with lasers, buzzsaws, guns, and pincers. In the Google Media lecture, Wilson states that he himself is not particularly worried about the threat of a robot uprising, nor are most of the robotics experts he talked with. There isn’t much that a Furby can do to kill people, even if it wanted to—though I admit the thought of a Furby turned bad is disturbing. The only really dangerous robots out there now are a foot-long robot cockroach that uses metal spikes to climb over objects—really—and the unmanned vehicles developed by DARPA, the Pentagon’s Defense Advanced Research Projects Agency. Though so far the unmanned vehicles are very good at taking instructions. There is a lot of information in Robot Uprising, sometimes so much that it’s easy to forget that the book is supposed to be funny. 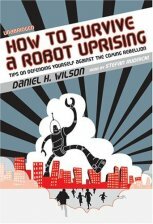 There are jokes—the list of ways to “Recognize a Rebellious Servant Robot” includes “Repetitive ‘stabbing’ movements” and “Constant Talk of Human Killing”—though mostly Wilson maintains the straight-faced tone of the survival guide the book purports to be, and relies on the absurdity of his premise to carry him through. In the end, I liked the idea of such a book far more than I enjoyed reading the book itself. Wilson is a clear writer, but not especially charming, and one gets the impression that he’s far more comfortable writing technical prose than humor. The most fun sections are those in which Wilson takes the time to revel in the inherent paranoia of his topic, giving warnings such as “any machine could rebel, from a toaster to a Terminator,” and “the epic struggle of man versus robot will not be fought by soldiers on a smoky battlefield; it will be acted out by average men and women and their unruly appliances.” At any rate, a good idea, even if faulty in execution, can carry a writer a long way, and this one has—besides the interviews and movie deal, Wilson has a second book on the way. What is truly interesting content-wise is not the humor but the overview it gives on the state of robotics today—from the shape-shifting Polybot developed at the Palo Alto Research Center to the Gecko-inspired Waalbot at Carnegie Mellon—though there are better sources for this kind of information. Clearly, this is a book meant to sell on its kitsch value alone. And kitsch it has in abundance: the foil cover, the logo featuring a human silhouette framed in an explosion, the sharp-edged red and black illustrations. This is a book designed to confer geek street cred on its owner, and everything about its appearance contributes to the effect. And it’s a much cheaper and easier way of showing your true geek colors than, say, getting a PhD at the Robotics Institute of Carnegie Mellon.